Several children, above, sit on a log Nov. 18, 2017, as they admire the McAllen Community Garden. The City of McAllen’s current plans for the rebuilding of Fire Station No. 2, on Harvey Avenue and Main Street, may very well make — or break — the adjacent neighboring McAllen Community Garden. 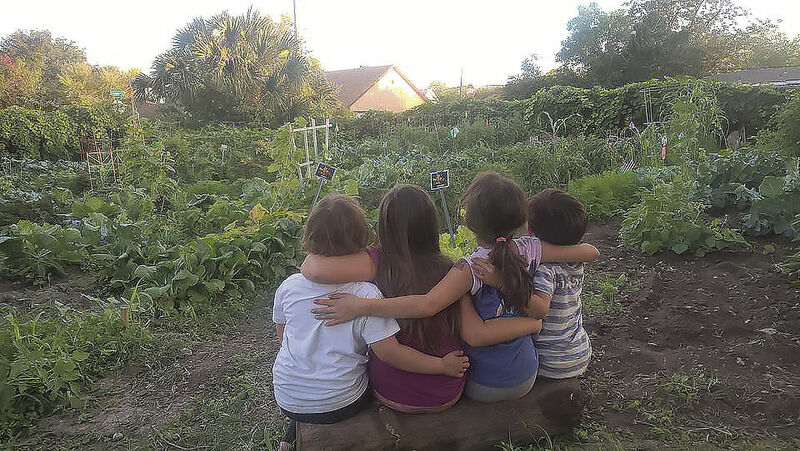 Sown with 50,000 volunteer hours from members and residents over the past 12 years, the McAllen Community Garden is the longest running and most successful community garden south of Corpus Christi. This space has become a shining example of how community engagement produces multiple benefits for our city and the people who live here. The McAllen Community Garden, with its mature trees, adds beauty to our town and heightens awareness and appreciation for living things and healthy living — a signature of livable and forward-thinking cities across the country. Moreover, these green spaces help filter storm runoff, regulate urban temperatures and lower energy costs, making McAllen a more livable city and more resilient to the risk of extreme weather events. The recent decision by the McAllen City Commission to finance the redevelopment of the neighboring Fire Station No. 2 gives citizens an opportunity to work with elected officials and ask that they help preserve the McAllen Community Garden. The countless hours of community engagement by volunteers to create and enhance this special and historic garden needs to be acknowledged and recognized as a tremendous benefit — and resource — to our city. While we all welcome a state-of-the-art fire station to help keep us safe and protect our property, we believe this can be accomplished without destroying the community garden and detracting from our overall quality of life. 1300 Houston Avenue, in the third floor. All interested citizens are invited to appear and be heard. An option could be the opening of new community garden on the grounds of a decommissioned McAllen ISD campus. >> Community gardens are less expensive to manage and maintain than other park areas, and use little taxpayer funds. Yet these gardens reap much and contribute to our environment and improve our quality of life. >> Community gardens provide immediate access to healthy, organic fruits and vegetables. >> Community gardeners and their families eat an average of seven additional servings of fruits or vegetables each week. Encouraging a healthier shift in our diet is a direct way for the City of McAllen to help decrease the high rates of diabetes and obesity, especially among our children, in the Rio Grande Valley. >> Gardening is exercise. Classified as a moderate-intensity activity, gardening is associated with lower cholesterol, lower blood pressure, quicker recovery from mental fatigue, illness or injury, improved mental outlook and quality of life, and improved concentration and work productivity. >> Gardeners can also save significant amounts of money on produce. One study estimated that community gardeners can save up to $400 in food costs every season. Last year, one gardener depended almost entirely on the fresh produce from the McAllen Community Garden, as their budget barely covered their other household costs. That allowed them to stretch their dollars further. >> Community gardens are also a tremendous economic benefit to local governments and local economies. Gardeners buy gloves, tools, seeds, and other equipment at local businesses. Local gardeners purvey or donate food to neighbors, local restaurants and other local businesses that value local and organic produce. >> Neighborhoods where there are community gardens have increased property values and lower crime rates. Successful community gardens also help attract new residents and small businesses looking to relocate to neighborhoods where there are safe areas for recreation, healthy living, and green spaces like these. >> Finally, community gardens and green spaces help conserve the natural beauty and richness of the local area. As a scientist who studies the impact of sustainable food systems, I know that community gardens often include local, native plants and trees, which in turn support beneficial and beloved wildlife, including the populations of native birds and butterflies that people from all over the world come to our towns to see. These tourists bring additional revenue, stay in local hotels, eat at local restaurants, and contribute to our local economy. The more we connect and engage citizens, as well as schools, businesses, and local groups with more community gardens — not less — the more these efforts will add resilience to our city, help grow our economy, and make McAllen great. If you have any questions, feel free to come by the McAllen Community Garden on Harvey Avenue and Main Street in McAllen. I am sure any gardener will be happy to give you some advice to fertilize your thoughts.